Give your child a place to eat, draw and read with our fantastic range of children’s table and chairs. The perfect accessory for your child to sit and play makes it an ideal addition to any bedroom or nursery. 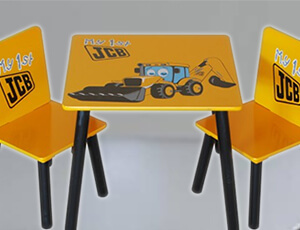 The shapes, colors, materials and sizes of our children’s tables, chairs and desks are designed with your little one in mind. Pieces are lightweight and easy to carry, yet durable enough to handle the rough and tumble of everyday play.